When you need to get things done, "active sitting" keeps you on your toes (figuratively, of course). We're with you: sinking into a sofa for some quality binge watching feels dreamy. But when you need to get things done—at the office, in the workshop—"active sitting" keeps you on your toes (figuratively, of course). This clever accordion-style perch is designed for just that: It compresses slightly when you sit, putting you at desk height (it also bends forward and backward), and keeps core muscles awake (hello, better posture and circulation). And in case you didn't notice, it's delightfully fun, too. Made from recyclable material in Fairfield, Iowa. 22" H x 17" dia. Suitable for people from 5'–6'4" tall. Great alternative to a chair! 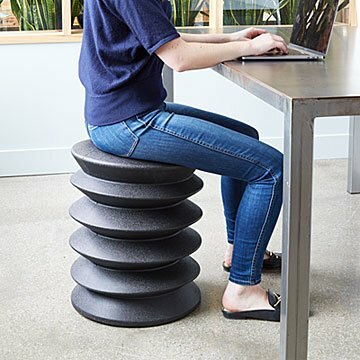 I love this ergonomic stool! I received it in September 2018 and have used it in the office every day since. Before I purchased this stool, I was sitting in a standard chair and noticed some tightness in my hips after a long day. Using the stool everyday, I have noticed greater flexibility in my hips and a slight challenge for my core as well. At 5'6", it keeps me at the right height for my desk/keyboard (no weird wrist angles) and the design allows me to squirm my position during the day. I love it, and my coworkers all ask where I got it!